Spencer taken to hospital as Town start season in style. 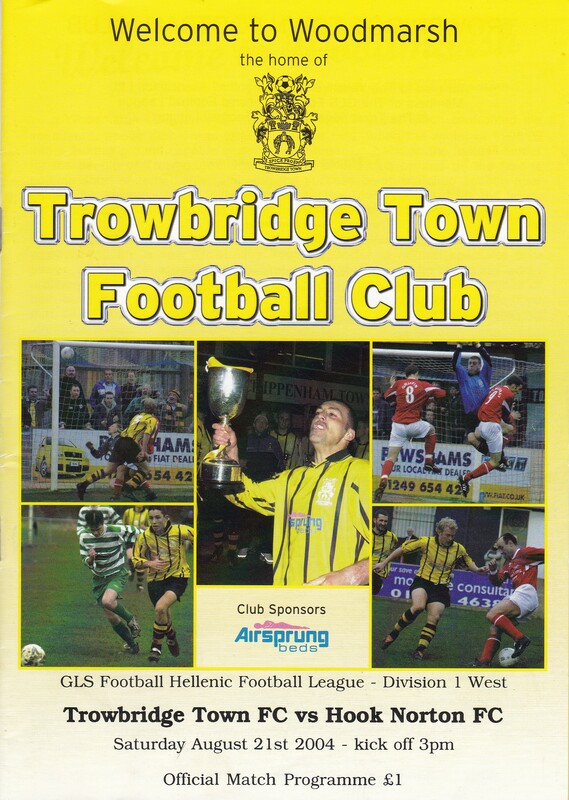 Trowbridge made a fantastic start to their first ever Hellenic League season with a confident and highly entertaining victory over relegated Hook Norton. Attacking from the off, two chances were created in the first six minutes. Dave Mitchell going close, following a cross from the left wing and Gavin Eyre just failing to get enough onto a header from a cross by Spencer Wilmott. The first goal came after eight minutes when Wilmott found Eyre on the right wing. Eyre cut inside and crossed for Ricky Trott to head home from the edge of the six-yard box. Shortly afterwards, Dave Percival sprung the offside trap and ran into the penalty area only to see his shot go just wide of the left post. Hook Norton rarely attacked but did manage a header towards goal and a corner after 21 minutes that were both dealt with comfortably by Adam Sheppard. In the 30th minute Spencer Wilmott was caught with a late tackle in midfield that unfortunately left him with a badly broken ankle and the game had to be stopped while an ambulance was called for. After closer examination, hospitalisation was necessary and a police/ambulance helicopter arrived to take him to Bath Royal United Hospital where his ankle needed to be pinned. It was nearly an hour later when the game restarted, Waleed Bakali replacing Wilmott. It took just five minutes for Trowbridge to add to their lead. A good ball down the right wing from Lee Wilson picked out Gavin Eyre and he threaded the ball to Dave Percival who crossed for Dave Mitchell to smash the ball home from close range. In the 40th minute Mitchell was brought down in the area as he tried to go past a defender but the resultant penalty, taken by Adam Nunn grazed the post and went for a goal-kick. However, it was only two minutes later when Dave Percival slotted home the third goal past an advancing Stuart Dellar following some good work in midfield by Trott and Mitchell.